Several months ago, Dr. Akin made a commitment for SEBTS to become not only a Great Commission institution, but also a praying institution. 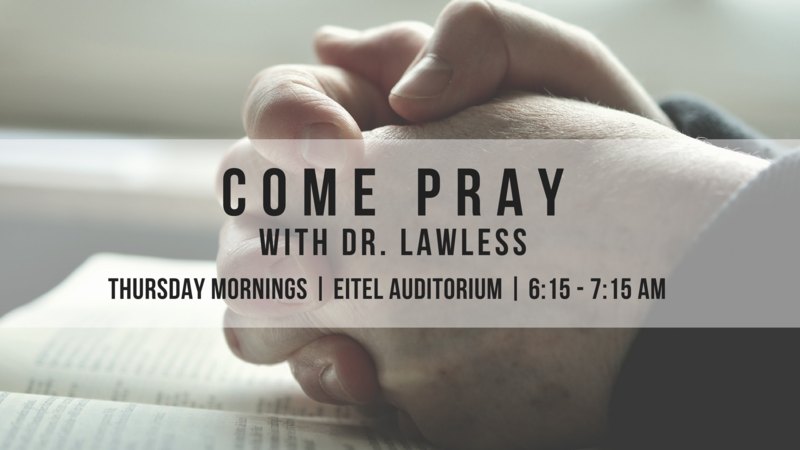 Every Thursday morning from 6:15 am-7:15 am in Eitel Auditorium in the CGCS, Dr. Lawless will be leading a weekly prayer meeting for the SEBTS community. We invite you to join us as we start the day by seeking God’s face together. If you are a distance student who would like to participate, please let Dr. Lawless know at clawless@sebts.edu. We are working on the details to make it possible for you to join us as well.